PalmerSport Sprint - it's back for 2019! Kwik Fit BTCC battlers set for Donington duel! Aston Martin Owners' Club visits Donington Park this Saturday! Bautista breaks record with 11th WorldSBK win! It's back for 2019! PalmerSport's compact Sprint programme returns to the Bedford Autodrome calendar this season with two dates already confirmed - Thursday 25 April and Saturday 29 June - offering a more affordable and time-sensitive alternative to the legendary full-day event. The Sprint programme has all the adrenaline-filled excitement of a full PalmerSport day for those whose time is limited. 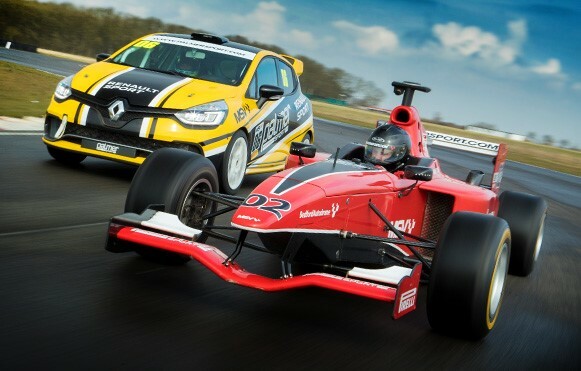 Guests drive the nimble Renault Clio Cup, a bona Fide British Touring Car Championship racer, and the F1-style Formula 3000 single-seater, with 15 minutes in each car on our premier 1.9 mile West Circuit - and no speed or rev limits! Every lap is timed with prizes awarded for the best drivers and guests enjoy exceptional catering throughout in our trackside and hospitality suites. With an early morning start, everything is wrapped up after lunch, leaving guests free for the afternoon. Download full details of the event here. Places are available for just £280 + VAT (£336) per guest. To book call 01403 733999. The 2019 PalmerSport season gets underway on Saturday 28 February and information about available dates and forthcoming events can be found here. If you would like to receive a 2019 brochure, please add your details here.